Of all the walks on the moor why this one? From the minute you get out of the car you are stepping back in time because as you look over Dunnabridge Pound wall you are staring the Bronze Age in the face. Then step by step the walk will take you through a palimpsest of Dartmoor occupation and land use. Once you reach Bellever Tor you will be at what is traditionally regarded as the centre of Dartmoor with extensive views in every direction. The ramble is also ideal for children as most of the climbs are tracked and gradual. Alongside Dunnabridge Pound at OS Grid Reference SX 64533 74600. As long as it takes to enjoy – its Christmas so where’s the hurry? As below with further in-depth information to be found by following the red links. Firstly, having parked the car, don’t miss the view to the north which looks up the valley of the West Dart river. Having drunk the vista head northwest to the first gate to the side of the pound – fig 1. this will take you through into the old Brownberry Newtake. From here continue heading along the track in a north easterly direction. This old track is known as the ‘Postman’s Road’ and leads all the way down to Laughter Hole Farm and House. The old route gently climbs uphill until it reaches another gate in the wall of the newtake – fig 2. Passing through this will take you further along the track to the next gate – fig 3. From here onwards the track leads you slowly back through time. A short distance from the gate, to the left of the track is the site of the Brimpts North Tin Mine which it is suggested dates back to the 16th/17th centuries – fig 4. It is from around this point that the panorama to the west begins to stretch far across to the Haytor ridge. A little further along the track the Loughtor Man looms into view and signals the fact that all around is evidence of prehistoric man. But don’t worry about him, he’ll be paid a visit on the way back and is certainly going nowhere. Once more on the right of the track are the remnants of an ancient reave which basically was a land boundary of those times. Keep heading along the Postman’s Road until yet another gate is reached. This one actually has a name and is known as Loughtor Gate – fig. 5. It may be a bit confusing as to why the name Laughter and Loughtor keep conflicting. This is because the old vernacular name for the many features in the area was ‘Loughtor‘ which has since mutated into or back to ‘Laughter‘. The first mention of the name was in 1362 in a Duchy record which listed Laddretorre and is thought to derive from either the Old Cornish word ledr or the Old Welsh word Llethr, both meaning ‘slop’ or ‘cliff’. Personally I prefer the old ‘Loughtor’ version but you could keep the kids happy and say its called ‘Laughter’ because when the wind blows from a certain direction you can hear the sound of merry laughter coming up from the valley below. This the old moorfolk say is the spirit of one of ancient old gods of the moor – complete fiction but it adds some interest. The route now enters the Bellever Plantation or what’s left of it and below the gate the East Dart River either tumbles or crashes, depending on the rainfall, through its valley. The immediate ridge opposite is Riddon Ridge and you can still make out the fields of the old farmstead called Whiteslade. The alternative name for the place is the ‘Snaily House‘ and is supposed to have been the home of two old women who lived on slugs and snails. From here follow the track downhill where the next gate, fig 6 will take you through to Loughtor Hole Farm. Just notice the huge, lichen decked trees by the gate which easily give the appearance of having been extras in the ‘Lord of the Rings’. Follow the track through the farm yard and don’t worry about the spaniel, all bark and no bite. The small stream that cascades down the side of the house in known as the Winford Brook and always seems to be in a hurry to join the East Dart below. 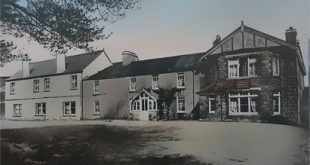 Loughtor Hole Farm was originally sited lower down the valley and dates back to around 1733, the modern bungalow was built sometime after 1890. On December 25th 1923, the then owners of the farm, the Stephens family reported that the whole house began to shake and many of the decorations fell down. The pictures on the walls were swinging wildly and it transpired the cause of this was an earthquake tremor which affected much of southern and central Dartmoor. Having gone through the farmyard and said a lusty hello to the horses head on northwards along the track. By now you will have probably noted the raucous serenade performed by the green woodpeckers, jays and magpies as they flit around the trees. If it’s later at night you may even hear the strange ‘cooick‘ loudly rising and falling which announces the presence of a nightjar, buzzards are also frequent visitors to these parts as their ‘screeling’ testifies. Just as the track begins to sedately descend their are some wide stretching views to be had of the East Dart river cascading alongside the edge of the plantation – fig 7. The path then leads through into the riverside plantation via a small gate – fig 8. Simply follow this through the car park where you will also find the luxury of a toilet block. Just as you come to the junction with a small road you will see a small, verdant green patch on the right of the track, this is now known as ‘Jack’s Bog’. The reason being it was here two years ago one of my Young Archaeologists – Jack had his first, knee-deep introduction to a Dartmoor bog. Having reached the road, turn right and head up to the modern bridge beside which you will see the remnants of a splendid Dartmoor clapper bridge – fig. 9. This is an ideal spot for lunch or a coffee break and depending on how quiet it is the chance to see the dippers as they bob up and down the river. From the bridge walk retrace your steps to the junction of the plantation road and then carry straight on up the hill to the Youth Hostel. This at one time was owned by the Prince of Wales where his pedigree herd of Aberdeen Angus cattle was kept. Keep heading eastwards up the hill towards the plantation until another gate is reached – fig 10. As you climb the hill keep an eye out for the purebred Dartmoor ponies that can sometimes be seen grazing in the nearby fields. Also have a close look at the old barn on the left-hand side of the lane. Here is a good example of early recycling as the old slotted gatepost now serving as the door lintel shows – fig 11. Keep heading up the tiny lane until the next, penultimate gate is reached – fig. 12. Just by the gate you will see a large tank with water gushing out, this is some of the sweetest tasting water on the moor but obviously for health and safety reasons you mustn’t drink it. Pass through the gate and take the track which leads southwest and follow it along until a small pathway can be seen leading uphill on the right-hand side, this is marked by a small post and yellow arrow – fig 13. Follow the rocky path upwards with the plantation wall on your right until the open moor is reached and Bellever tor comes into view. If you want a breather then someone has provided a well placed seat where you can relax and enjoy the view. Once on the moor follow the path northwards that runs alongside the trees where you will come to where the plantation has been cleared. There are very few signs but you have just walked through a prehistoric field system and are about to enter the Bellever ritual complex. This consists of kists, a stone circle and a stone row. This walk will visit what I think is one of the best kists on the moor, if however you would like to see the rest of the features then they are detailed on the Bellever Complex page. Once you reach the crossroads of the tracks continue straight ahead until you reach the fenced off kist on the left-hand side – fig 14. Having taken in the Bronze Age landscape it’s now time to visit Bellever Tor, so just head back south and walk towards the trig point on the top of the tor. Bellever was thought to have been the central point of Dartmoor and from its rocky outcrops there are splendid views in most directions – fig 15 and fig 16. The tor was once thought to have been a centre for worshiping the old god Baal and possibly the origin of the name – Bellever. In later years the tor and its surrounds were the venue for the annual Bellever Races. Legend also has it that the tor is home to the piskies where many travellers have become ‘pixie led’ such as the unfortunate Tom White. Should you have escaped the attention of the little folk just follow the well defined path down from the tor in a south easterly direction to the last gate – fig 17 which will lead into Loughtor Newtake. Have a look at the two massive pillars that represent the old gateway and notice the old post slots that would have made the original gate. Pass through the modern gate and head up towards Laughter Tor which is clearly marked by a visible path heading in a westerly direction. The first thing you will meet is the western edge of the tor and then a huge, walled rectangular structure, this is the ‘Sheep Measure‘ – fig 18. This is another ideal spot to take a breather and inside provides an excellent shelter from the frequent moorland winds. Don’t be alarmed if you see someone demolishing the wall because some clown has sited a letterbox in the wall which is strictly against the letterboxing code. Once again you are stood in a prehistoric landscape which is described in greater detail here at the Laughter Tor Complex. The most spectacular feature being the huge menhir known lovingly as the Loughtor Man – fig 19 and its associated stone row – fig 20. From the menhir simply rejoin the old Postman’s Road and return to Dunnabridge Pound. Before you jump into the car and head home take a quick look inside Dunnabridge Pound and the old pound keepers cottage – fig 21. I am not going to waste time running through the safety, liability and equipment warnings. Needles to say this walk is on Dartmoor where it can get wet, cold, and very foggy so take appropriate footwear and clothing, preferably an accurate map and compass along with the ability to use both.